The 2015 inSpirit title. The inSpirit Series was previously known as the Meditation Manual Series. 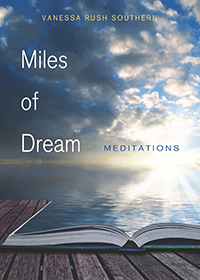 By popular demand, the Reverend Vanessa Southern returns with a new collection of meditations for personal and congregational use. With her familiar light touch and deep insight, Southern ponders life passages, ways of looking at the world, and the many possibilities for building a life of meaning. Her reflections, at once playful and poignant, remind us that we can come to a deeper awareness about living well by looking more closely at our daily lives. What is the best way to pray? I do not mean what is the best way to appease God, or the gods, but how do we put our hearts in just the right place? Because, by my lights, this is the primary and best purpose of prayer. Of course, the perfect prayer should probably be one of gratitude, at least partly, and maybe mostly. It has to be a re-grounding in all that is good, which we inevitably overlook when we get used to having it around. I read years ago that the average American now lives better than how 99.6 percent of human beings have lived in all recorded history, and the wine sold in any corner bodega or convenience shop today is better than the wine French kings drank until relatively recently. For such lucky folks, though, we sure do whine a lot. So, gratitude has to be part of the praying. If there is more to prayer than gratitude, then for me it would have to include the request that you and I be put to good use. It cannot be right to simply hand back to the world only what was handed us, like the person in the biblical story who buries his talents rather than risking them in the world. Still, if you are like me, maybe you aren’t always sure just what would be the best use of your gifts are; so a good prayer might ask for whatever hints the universe has the energy to dole out. I would also pray that the people I love are kept safe. I suppose that sounds selfish, but I don’t believe the One Who Listens is doing more to keep my team safe just because I ask for it. It is just that loving these people as much as I do makes me vulnerable. I imagine it does the same for most of us. And it seems only fair to ask for help in holding what could break us. Finally, the perfect prayer, it seems, would have all kinds of surrender in it.. It would ask that we find a way to be in each day without reservation, to use it up and delight in the embarrassment of beauty and riches cast before us by luck or chance or some lavish, numinous hand. I think for most of us it would ask for the chance to press forward just a whit the arc of human wisdom and compassion and to recognize those chances when they come. Finally, exhausted and joyful for what that particular day has offered up, the perfect prayer, for most of us, would likely end with whispered hope for the chance to wake up and face it all again.